Powers/Abilities: Nergal is presumably immune to aging and conventional disease. He possesses superhuman strength (possibly Class 100) and durability. As a former war god, Nergal presumably is (or was) proficient in numerous forms of combat and the use of various weapons. As a death god, he presumably has some ability -- beyond the conventional -- to slay and/or resurrect others. In his limited appearances, Nergal granted some of his own magical power to the Hand of Nergal. He could manifest on Earth as a giant monster of great power, though apparently less powerful than Tammuz. (Myth history) - Nergal is the eldest son of Anu, Ruler of an extradimensional race of beings known as the Annunaki, who were worshipped as gods by the various empires and tribes of Ancient Mesopotamia, and his wife, Mami, goddess of motherhood. The Anunnaki were first worshipped during the pre-Cataclysmic era, but gained special prominence following the cataclysm that ended the Hyborian Age. They had a great impact on the rise of the Sumerian Empire, one of the first great human civilizations, after the end of the Hyborian Age, during which they were at their height of worship. The Anunnaki are therefore counted among the oldest gods known on Earth with the possible exception of the Ogdoad, ancestors of the Gods of Egypt. As Meshlamtea, Nergal was god of war to the Sumerian Empire as they conquered and subjugated their enemies, but as a god, he tried to conquer the underworld of Allatum, the realm of the dead ruled by Ereshkigal, and became a darker more malevolent deity known as Nergal. Rather than cede control of the underworld to Nergal, Ereshkigal took him to her bed and shared her power with him as her husband. Nergal rarely stayed bound to the underworld and instead spawned war and blood thirst on earth leading mortals and gods against their enemies. A group of seven gods known as the Sebettu, known to the Babylonians as the Isirru, often followed Nergal into battle to spread famine, drought and pestilence through their enemies to prevent survivors. Nergal played no partiality against his brothers, Enlil and Hadad, in their wars against each other to become king of the gods; he instead supported both brothers in their wars, preferring the bloodshed of battle over everything else. Nergal was called Assur as the patron god of the later Assyrian Empire. Most of the Mesopotamian Gods later retreated to the other dimensional realm of Celestial Dilmun created by Anu since his exile from earth centuries before, but after the fall of the Assyrian Empire; Nergal instead retreated to Allatum rather than be counted among the gods accepted by Anu into Celestial Dilmun. Following the fall of the Assyrian Empire, most of Mesopotamia either fell under control of the Greeks and later the Romans and adopted their gods or were converted into Judaism, Islam and later Christianity. (Conan the Barbarian I#30 (fb) - BTS) - Ages before the King Kull ruled Valusia (circa 18, 500 B.C. ), the Hand of Nergal fell from the stars. (Savage Sword of Conan#230 (fb) - BTS) - The Hand of Nergal, along with its counter-talisman, the Heart of Tammuz came into the possession of the sorcerer Xaltotun of Acheron. (Savage Sword of Conan#230) <13000 B.C.> - Xaltotun considered using the Hand of Nergal and/or the Heart of Tammuz against a time-traveling Red Sonja when she stole the Heart of Ahriman from him. He initially decided it was too complicated, but when she escaped his chamber he summoned the Heart of Tammuz. (Conan the Barbarian I#30 (fb) - BTS) - An unidentified author wrote in the iron-bound Book of Skelos that the Hand of Nergal brought two gifts to its possessor: first, power beyond all limit, and then death beyond all despair. 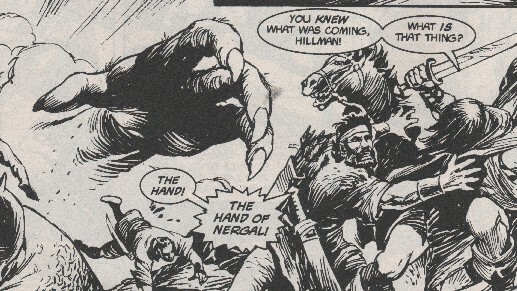 (Conan the Barbarian I#30 (fb) - BTS) - The Hand of Nergal was brought via caravan from the depths of Stygia to Munthassem Khan, the wise and gentle satrap of the Northern Turanian city of Yaralet. From that point on, Munthassem became cruel and savage: his guards seized any who so much as grumbled of their lot, and they were never seen again. Weird forces shielded Munthassem from those despairing patriots who sought to slay him, and strange crimson lights blazed in a tall tower of his palace, where men whispered that he had dedicated a temple to some dark and bloody god. Meanwhile, terrors stalked the moonlit streets of Yaralet, as if summoned from the realm of death by some devil-purchased lore. Tales spread of doorways splintered in the night and of brief unearthly shrieks torn from human throats. 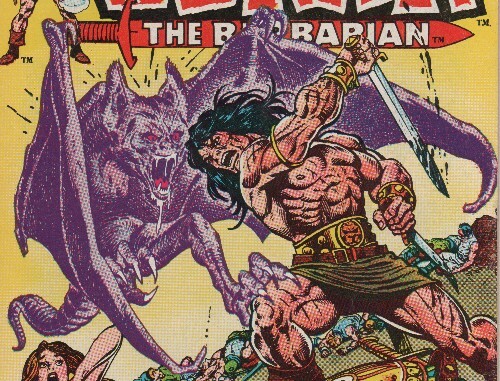 (Conan the Barbarian I#30 (fb) - BTS) - Munthassem Khan had all wizards of Yaralet slain, but he allowed the philosopher Atalis to survive, though Atalis was plagued with fits of agony. In addition, Prince Thann developed fits of blindness. (Conan the Barbarian I#30) - King Yildiz sent his army, including Conan of Cimmeria, to battle Munthassem Khan's legions. After five hours of bloody battle, Munthassem (apparently drugged with the dream lotus) used the Hand of Nergal to summon winged devil-beasts -- the Shadows of Nergal -- that descended upon and slaughtered Yildiz's troops. Even Conan found his sword arm of little use against the devil-beasts. When one of them threatened to slay him, Conan unwittingly grasped the amulet he had received earlier (the Heart of Tammuz), causing the devil-beast and its brethren to flee. After recovering from his magical injuries, Conan's service was enlisted by a Brythunian woman, Hidilco, who had been sent by her master, Atalis the Far-Seeing, to recruit the Cimmerian. Atalis told Conan of Munthassem Khan and the Hand of Nergal, and also shared that Conan possessed the Hand's counter-talisman, the Heart of Tammuz. Atalis led Conan and Thann into Munthassem Khan's chamber, intending to ambush the still-drugged Munthassem, but he suddenly awoke, announcing that he had been expecting them (he had sensed Atalis peering at him through his mystic crystal). Munthassem Khan swiftly dropped Atalis and Thann with their fits of pain and blindness. Conan rushed to the attack, but as he knew not how to invoke the Heart of Tammuz' power, Munthassem Khan struck him down as well. Hidilco then rushed in, seemingly in anguish over Conan's injury, but she suddenly grabbed the Heart of Tammuz and hurled it across the room, knocking the Hand of Nergal from Munthassem Khan's clutches. A darkly shimmering glow spread from the Hand of Nergal, the feast of the pit its unholy breath, the bone-deep chill of interstellar space its blighting touch. As the glow grew larger and blacker, the dark shape of Nergal swelled into a vast ebon thing, brutal, hulking, misshapen, more like a stupendous age than a man, its slitted eyes blazing like black, malignant stars. At the same time, a nimbus of light surrounded the Heart of Tammuz, and the colossal form of the more humanoid Tammuz appeared. The two forces clashed with a roar like colliding winds; Nergal gained the early advantage, but then Tammuz' all-pervading brightness dissolved Nergal's dark form. The Heart and Hand vanished, and Munthassem Khan was gone, as well, leaving behind only a handful of smoldering ashes. (Savage Sword of Conan#220 (fb) - BTS) - Atalis gained the Hand of Nergal and the Heart of Tammuz, and he ensorceled Prince Thann who replaced Munthassem Khan, becoming as much a tyrant as his predecessor. With the help of the Hand of Nergal, which took the form of an immense taloned claw the size of the real Nergal's hand, Atalis (via Thann) began trying to subdue the hills. (Savage Sword of Conan#231 (fb) - BTS) - Atalis bound the Hand of Nergal to the warrior Fafnir, merging it with the demonic Arm of Kx'ulthuum and enslaving Fafnir to his will. (Savage Sword of Conan#220) - Years later, Conan -- now leading a fighting force including the Free Companions and the Kozaks on the steppes west of Turan, rode to Northern Turan in search of allies. Conan's forces were suddenly assaulted by the immense magical Hand of Nergal, which decimated them until turning back into mist and vanishing back toward Yaralet. Conan and several other warriors traveled to Munthassem Khan's former quarters, where they were confronted by Atalis who revealed his involvement, and also revealed his warrior servant, Fafnir of the Demon Hand. 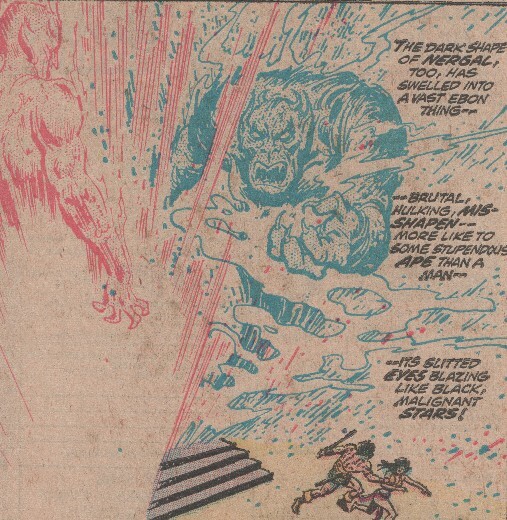 (Savage Sword of Conan#221) - Fafnir of the Demon Hand obeyed Atalis' orders and savagely defeated Conan, taking a brief moment to strike down Conan's allies with a magical blast. From his dungeon, Conan slyly advised his new female ally Taqui to win Atalis' heart. Atalis drew the Hand's power against Tacqui to make her more compliant, but when he stopped she broke free from him, grabbed the Heart of Tammuz, and fled. She ran into Conan, and when Fafnir attacked Conan again, Tacqui struck the Heart of Tammuz against the Hand of Nergal, stunning Fafnir. 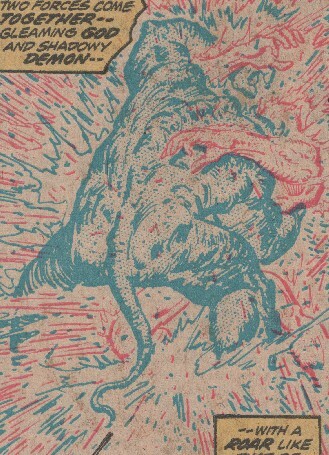 Conan defeated and Fafnir recovered, the Heart of Tammuz having merged with the Hand of Nergal, granting Fafnir control of his own will and full control of his new arm's power. See Fafnir Hellhand for the subsequent appearances of the combined Hand of Nergal/Heart of Tammuz. (Marvel Spotlight I#18 (fb) - BTS) - At some point Nergal wed Allatou, a menial of the court of Satan (Marduk Kurios); they remained married into the modern era. Comments: Adapted by Lin Carter and Robert E. Howard. Adapted to the Marvel Universe by Roy Thomas, John Buscema, and Ernie Chan. was married to two wives is sometime you may want to consider. I personally vote that Nergal took two wives, but that remains unconfirmed. I'm pretty sure the Hebrew people condemned all polytheistic religions as devil worship, and so any texts may refer to them as demons. There is some evidence that a number of the Mesopotamian Gods have degenerated into demons of the millennia. If you don't believe me, check out: Baal, Dagon/Enlil/El, Eriskegal/Ereshkigal, Inanna/Ishtar, Lilith, Marduk, Moloch, Ningal, etc. Whether these demons are the true Mesopotamian Gods, or demons posing as the Gods, or whether the Gods usurped the names of older demons (just like Seth did to Set), is unclear. In the All-New OHotMU Update#3 Nergal received a paragraph in the Annunaki entry. Profile by Snood, with myth information from Will U. Hand of Five - a.k.a. Hand of Five Dooms; created by Maur-Konn, used by Dr. Demonicus against the Shogun Warriors, battled Combatra . Dropping from the sky prior to 18, 500 BC, it was an instrument of black magic, opposed or controlled on occasion by the counter-talisman the Heart of Tammuz. It initially appeared in the form of a mummified hand on a stick, grasping an egg in its palm. The Hand came into the possession of Xaltotun of Acheron circa 13,000 B.C. and was brought to Yaralet from Stygia circa 10,000 B.C. It transformed Munthassem Khan from a kind to a cruel leader until it was taken from him via the Heart of Tammuz, and it vanished when Tammuz seemingly destroyed Nergal or a manifestation thereof. 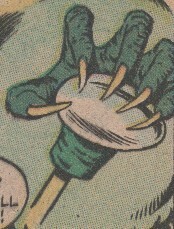 Atalis regained the the Hand of Nergal, which then took the form of a monstrous hand comparable to Nergal's own three-fingered (and one-thumbed) hand. Atalis merged the Hand with Fafnir's Arm of Kx'ulthuum, enslaving Fafnir to his will. Atalis sent a magical construct of the giant to oppose his enemies as he plotted to conquer the hill people, but lost its power after Fafnir's merged Hand was further combined with the Heart of Tammuz. Fafnir was left with the Hand's power but freed from outside control. Also known as the Devil-Beasts of Nergal, they were immense bat-like creatures summoned by Munthassem Khan via the Hand of Nergal and used to slaughter Yildiz's troops when they were sent to capture him.